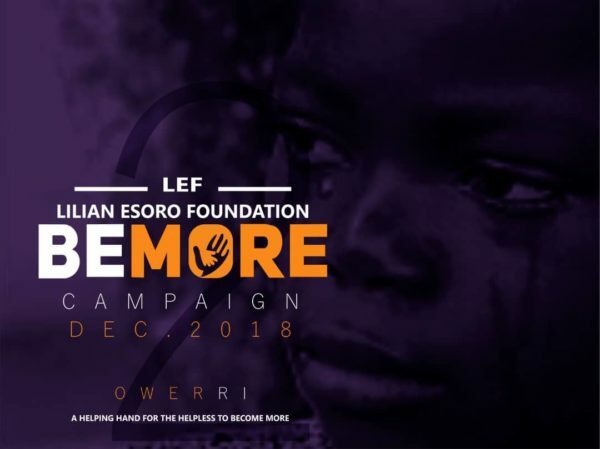 The Lilian Esoro Foundation launched last year. We are glad we were able to empower and make 30 people their own bosses with start-up kits and cash gifts. We were also able to send 50 kids back to school with back-to-school packs and school necessities. This year we hope to do much more as we have also included free eye test and 50 optical lenses for those who need them for free. If you’re also moved to donate to this course, here are the few things needed for the Owerri BeMore Campaign scheduled to hold on Saturday, December 15th, 2018. Any form of donation will go a long way; clothes, cash, sewing machines, industrial blending machines, clippers, school bags, socks, books, school shoes, clothes, vegetable oil, Ankara, rice, pedicure bowls etc. Thanks in advance and God bless. With your help, we can do more! LEFoundation, be the hope and change one life at a time! Be part of the ‘Be More Campaign’ Season 2. We would like to appreciate all our partners and sponsors so far. God bless you all. For sponsorship and partnership, kindly email [email protected] or follow @LiLianEsoroFoundation on Instagram.